For URGENT technical issues you may be experiencing at the stations, please phone 0800 2 CHARGE (0800 224-274). This phone is monitored after hours by our small team on a roster basis. Our office is open Mon-Fri, 9am-5pm, and we welcome your general enquiries by phone during these times. Alternatively email info@charge.net.nz or contact us via our web form or Facebook page. We will generally respond within one working day. Maybe your question has already been answered on our FAQ’s page. Ensure your EV is switched off before proceeding. Icon (1) flashes when the unit is available for use. After plugging the handset into your EV, the RFID and STOP buttons will be highlighted. Swipe your RFID fob over this area for 3 seconds until the MAX/80% and START buttons light up. Toggle button (3) to select a maximum or 80% charge amount. If not pressed, it defaults to 80% charge. Push the blue button to start a charging session. This will time-out if not pushed within 3 minutes. If this happens, replace the handset into the holdster and start again. Push to stop the charging session at any time. If you used your RFID fob, then you will need to swipe this again before pressing stop. Icon (6) flashes to indicate that the charging session is complete and the handset should be returned to the holdster. Icon (7) will light up when the charger is not in service. Lit when a charging session is in progress and the interface panel is locked. The blue panel lights up when the station is active. The LED screen displays minutes connected on the left; the centre toggles between battery percentage during charge, and total dollars spent; and the right displays kilowatt hours delivered. In the unlikely case of emergency, press the red Emergency Stop Button at base of station to shut down and secure the DC Fast Charger. 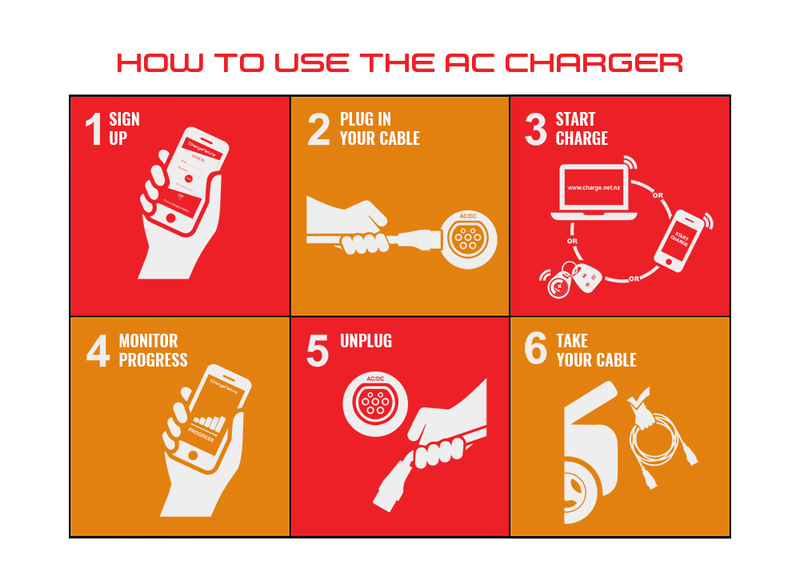 While the AC Chargers are free to use, you must have a ChargeNet account in order to do so. You can sign up for a free account via our phone app or the charge.net.nz website. Plug your cable into the charger. You are required to bring your own cable and charging units are socketed and have no cables attached. Cables supported are either Type 2 to Type 1 (j1772) or Type 2 to Type 2. Start a charging session by tapping your ChargeNet RFID tag on the charger in the indicated area. You can also initiate a charge via the ChargeNet website or app. You can monitor the progress of your charging session through the ChargeNet app. Your charging session ends when you disconnect your cable from the charging unit. If you plug it back in, it is considered to be a new charging session and reauthorisation is required. After you have finished your charging session don’t forget to take your unplugged cable home with you. 1. Via the ChargeNet phone app. Download the ChargeNet NZ app free of charge from Apple App Store or Google Play Store. You must have already registered an account at charge.net.nz to enable you to login to the app. Log-in by inserting your username (email address) and password. The station closest to you will appear on the app map. Click the station. Plug your car in and then Activate Station. From there, continue starting the station as if you had swiped your RFID fob. ie: on the station dashboard, choose 80% or Max Charge, and then press Start. On your smartphone browse to the ChargeNet website and press Start Charge. You will be requested to log-in. The stations are listed in geographical order. Find the station, plug your car in and then click Start Charge. From there, continue starting the station as if you had swiped your RFID fob. ie: on the station dashboard, choose 80% or Max Charge, and then press Start. Any mobile phone, regardless of whether it is a smartphone or not, can text to start. This function is available on all of our newer stations (ie: some of the first stations we installed do not have this feature.) On the front panel of the station, you will see the text to start instructions if available. Text the word charge and the 6-digit station number printed on the front of the station (no spaces) to 226. For this function to work, you must be using the mobile phone number that your ChargeNet account is associated with, ie: the one you inserted into your registration form. 4. Phone 0800 2 CHARGE and request a remote start. We will verify your account details, so if you are not the account holder, please ensure you have permission to start on account with user’s name and email address. Please note that we operate our 0800 Helpdesk 24/7 on a volunteer basis and while we endeavour to answer every call, at times we are on other calls or otherwise unable to answer the phone. Please carry an RFID fob with you in case you are unable to get through to us. * If our stations are not communicating with us because cell network is down, remote activation will not work, but the station will still be operable. 2. Error Code 5 or 22: Ensure your car is turned off (or in park for some models). You can usually turn it back on after charging has started. 3. If the station is not responding as you’d expect, it may have timed out. Our chargers time-out after 180 seconds of inactivity. Replace the cable’s handset into the holdster and start again. 4. If the charger is counting down or none of the icons are lit, the machine may be resetting itself after a communications error. Please hang up the cable and wait until the countdown is finished and the lights come back on. 5. If the “Not in Service” icon is lit, please phone 0800 2 CHARGE. 6. If the cables are damaged or missing, please phone 0800 2 CHARGE. Do not attempt to use the station. 7. Our DC Fast chargers can only charge one vehicle at a time. Ensure the other cable is hung up securely. 8. If there is an emergency, such as a fire, push in the red emergency button to shut down and secure the charger. When it is safe, please phone 0800 2 CHARGE and do not attempt to restart the machine. 9. Error Code 188: E-STOP. If the Red Emergency Button is pushed in, the screen will display E-S⌉OP. Please check the machine is not damaged and if no problem seems obvious, turn the emergency stop button to the right until it pops out. The charger will begin a countdown while it performs a self-diagnostic check. This will take 5 minutes. 10. If you need to stop your charge before it has finished, wave your key fob over the wi-fi symbol, and press the green Stop button. You may simply press the stop button if you activated your charge remotely (without a key fob.) If you still cannot remove the handset from your vehicle, it is usually because you need to deactivate charging on your vehicle dashboard. If you are still having trouble stopping the charging session, please phone 0800 2 CHARGE and we can remotely stop the charge for you. Please don’t push the e-stop button, unless you cannot get hold of us. If you do, please reset it before you leave. For all other error codes, please phone 0800 2 CHARGE. The Network Status information has moved here.